Don't forget the upcoming ISLN meeting in the secondary school library at UWCSEA East. That's Tampines (not the Dover campus). Tampines St. 73 is very short -- you can't miss the building and there's only one entrance. Yes, there's parking. We're just off Tampines Avenue 10 -- not far from IKEA. That's Monday, Apr 28th, 4:00 for 4:00pm start. Besides the Annual General Meeting business, we've got Denise Tan from Closetful of Books coming with a display of books, especially regional ones, for us to browse. She'll undoubtedly have books by many of the authors that you'll get a chance to hear at the AFCC at the end of May (see details further on) -- as Denise is coordinating school visits for the AFCC authors. Tigtag is the one-stop resource with over 600 outstanding films, lesson plans and classroom activities to support your science teaching and inspire students. If you want to start a free trial of the product before the meeting, contact her via email: greilly@twig-world.com . Other information to be imparted includes an update on the Readers Cup competition in May and an outline of the process of determining shortlists for next year's Red Dot Book Awards. 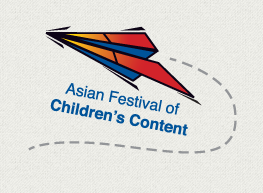 A reminder about the AFCC (the Asian Festival of Children's Content), May 31-June 3. Registration is open. The cost for the Writers & Illustrators Conference, June 1-3, is $350, but we usually get a 10% discount -- which would make it $315. You can also get a one-day ticket for $200. See their website: http://afcc.com.sg/ and this PDF brochure: http://afcc.com.sg/images/uploads/2014/AFCC14-teaser-1.pdf . The country focus this year is India. The children's literature lecture will be given on the evening of Monday, June 1, by Fatima Sharafeddine. Our distinguished speaker is Fatima Sharafeddine, an award-winning Lebanese writer twice been nominated for the prestigious Astrid Lindgren Memorial Award. A writer and translator of children’s books, Fatima has published over 100 books including Grandpa's Donkey (Arab Thought Foundation Award, 2012), The Book of Laughter and Crying (Anna Lindh Foundation Regional Award, 2011), and Princesses of the World (IBBY Translator Honor List, 2012). She lives between Belgium and Lebanon, and participates in several international book fairs as well as offers workshops in writing for children. Most of her books are published in Arabic, and several have been translated to various European languages, among which are Dutch, Danish, Spanish, French, German, and English.